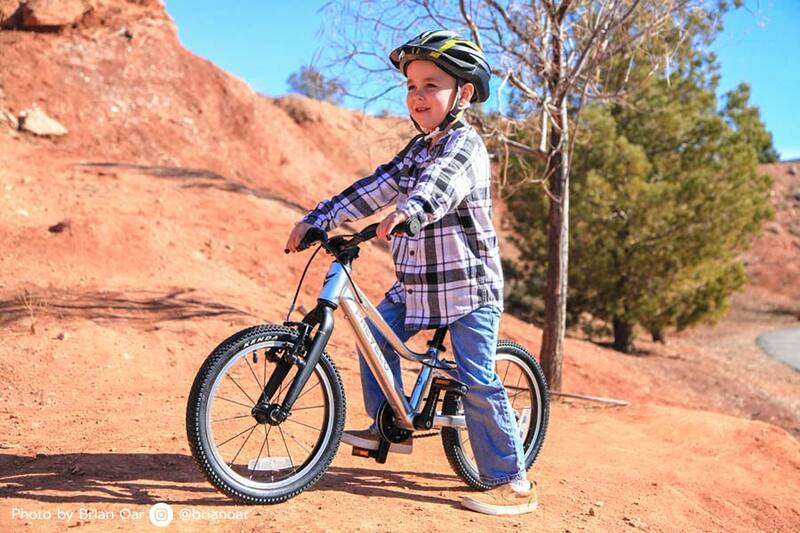 The Prevelo Alpha Two is a 16” wheel, single speed bike designed for kids between the approximate ages of 4 and 6. It resembles an adult mountain bike, only on a smaller scale. Prevelo has done the math with this bike so its profile is low and narrow. This allows children to hold their balance and stay in control. And, you won’t have to worry about the Prevelo Alpha Two being too much for your kid to handle. Seat Height: 17.7" - 25"
The Alpha Two comes with a kid-sized crankset – one that Prevelo designed specifically for a bicycle this size. The crankset measures 95mm. The ground clearance of the bottom bracket, which connects the crankset to the bicycle, has been sized down as well. 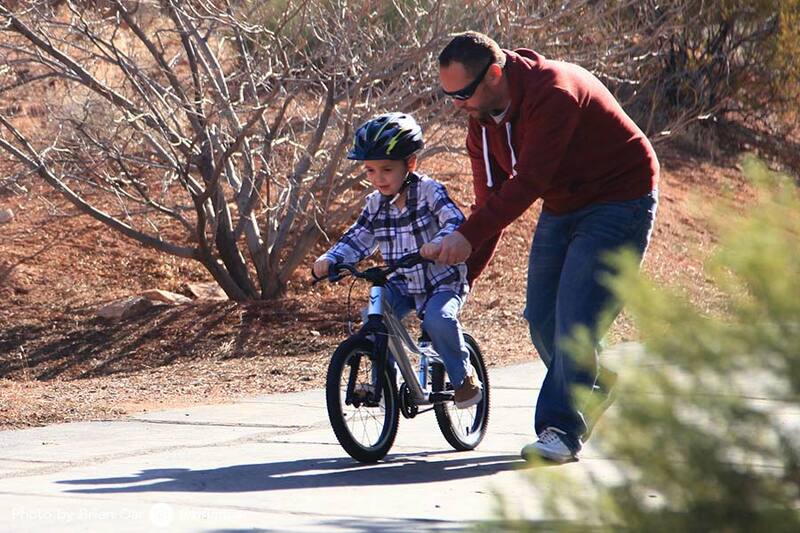 This allows your child to get the best performance possible while straddling and riding the bike. Weighing in at a total of 14.5 pounds, the bike has a minimum seat height of 17.7 inches thanks to the short seat post. The bike also comes with a longer seat post to allow a maximum seat height of 25 inches. 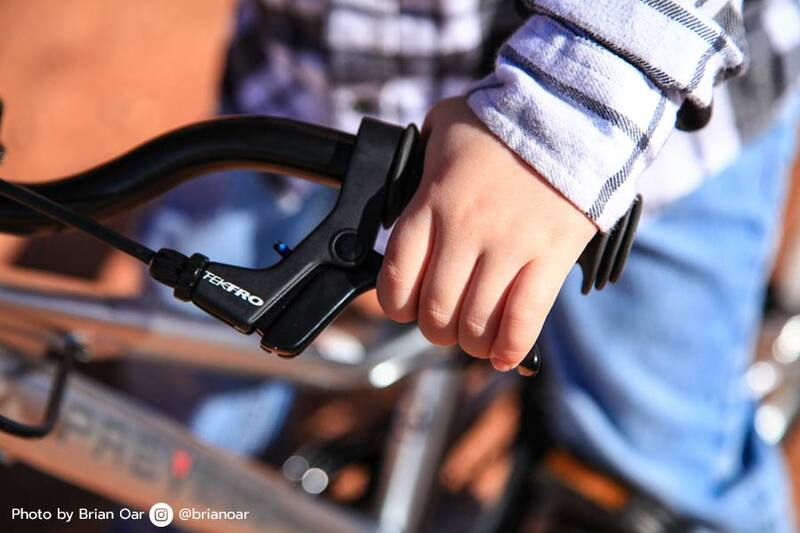 This range of seat height not only enables your child to continue using the bike as she/he grows – it allows the bike to be designed without a coaster brake as per safety regulations. 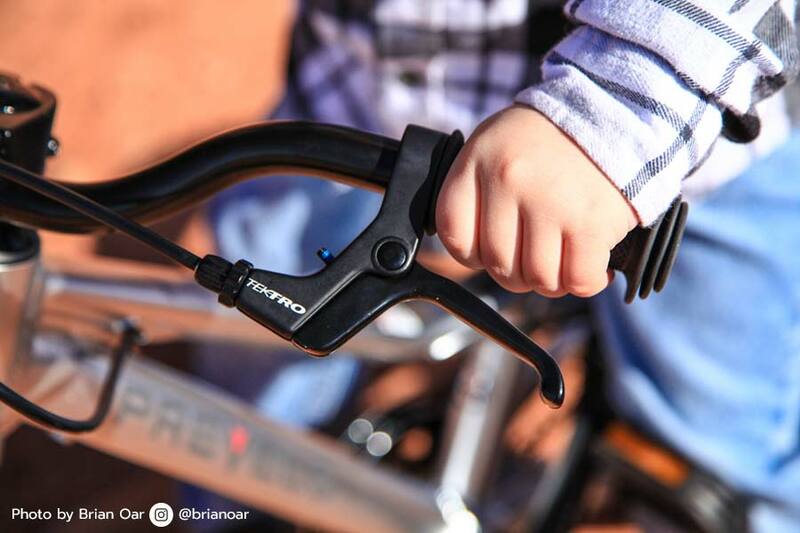 If your child is transitioning from a balance bike for the first time, the absence of a coaster brake lets the rider get used to hand brakes at a smaller size and/or younger age. The quick-release seat collar is also a great standard feature. 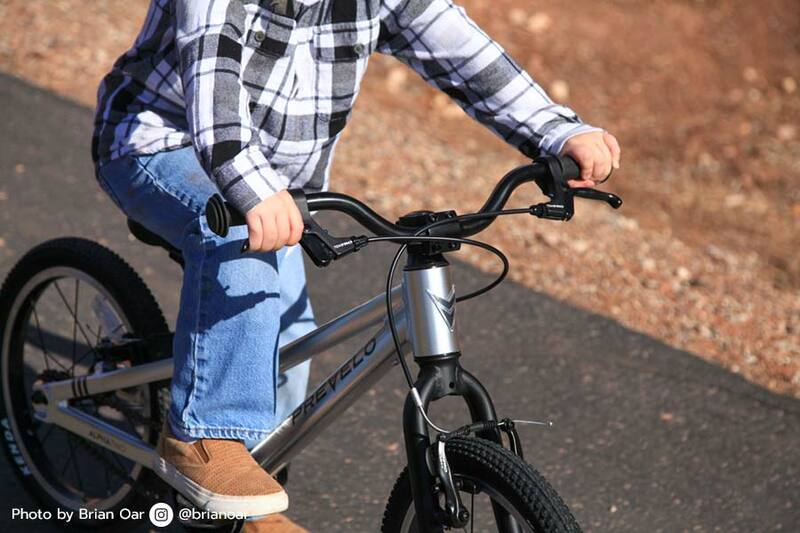 We have had to pay additional money for a quick-release seat collar on other higher priced kids’ bikes we have owned. Our test rider couldn't keep his eyes off the shiny new Prevelo Alpha Two. We couldn't either. The polished aluminum finish is a classic look for this girls and boys 16" wheeled single speed bike. 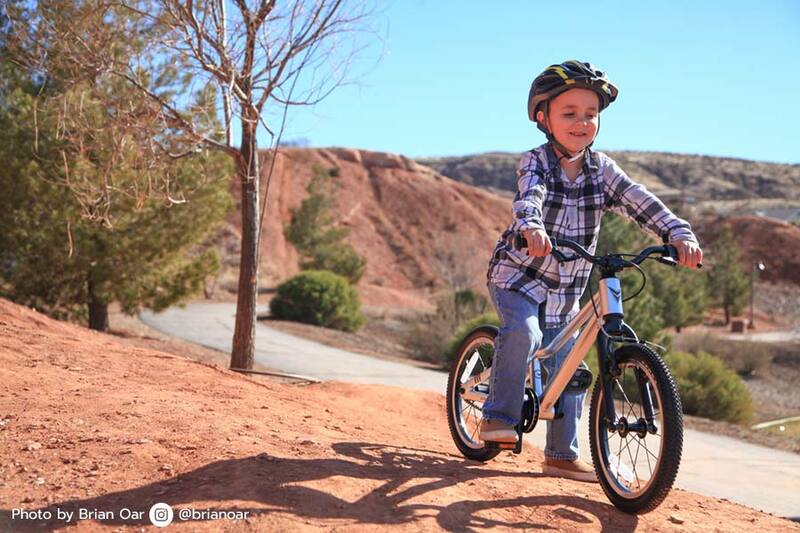 Our test rider was confident on his bike with training wheels but had not yet committed to earning his turns on a pedal bike – until he rode the right sized bike. With a little help from his dad, this young man was off-and-rolling. 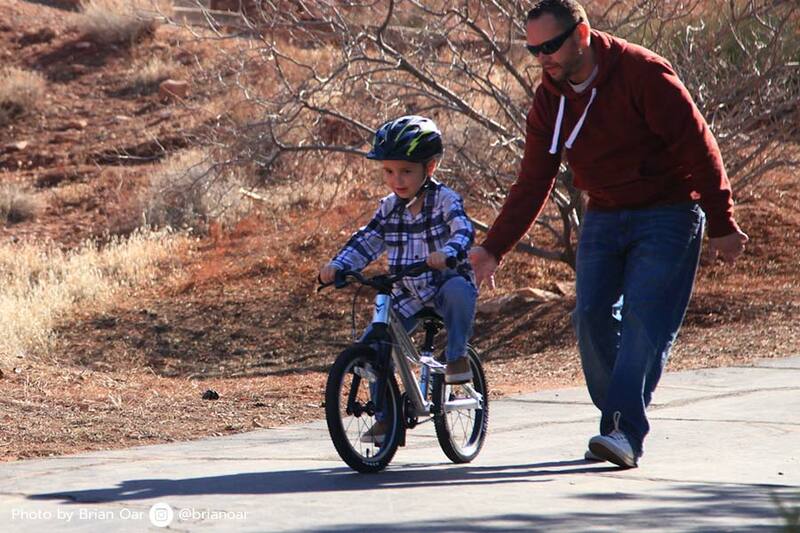 We’re pretty happy to be able to take part in this special moment for this young cyclist and his father. 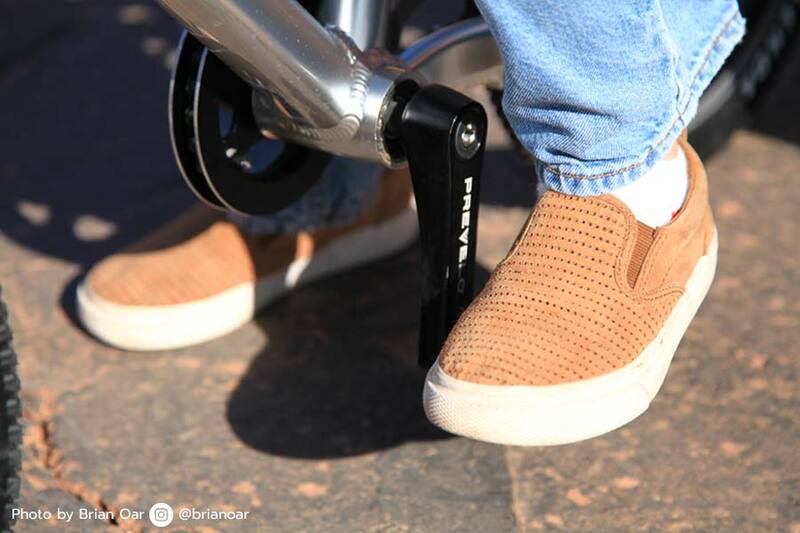 The single speed drivetrain and easy-to-reach brake levers means the bike is simple, but functional. Our rider really enjoyed increasing his speed and stopping with both brakes evenly. 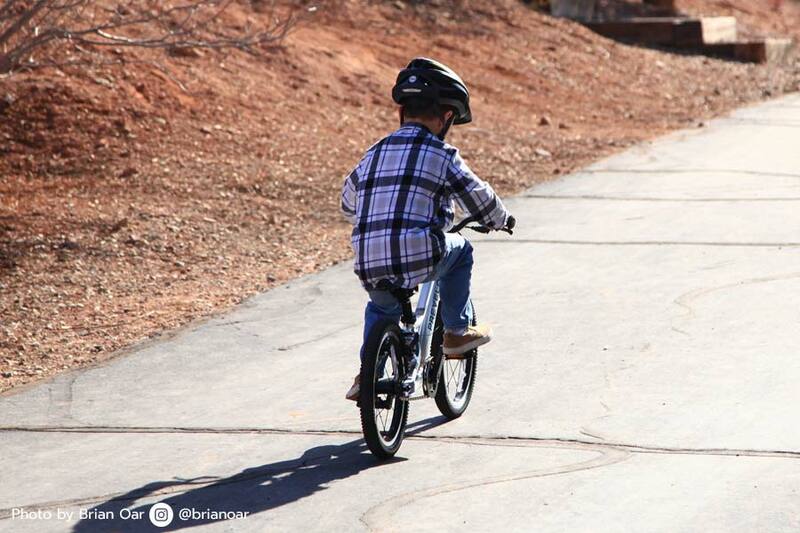 The fit of the bike allowed him to enjoy pedaling and control his turns. Riding a real bike for the first time only happens once. The look on this kid's face says it all. A lightweight frame made of 6061 aluminum custom-formed tubing is the foundation of the bike. Internally routed brake cables complement the clean and tight design. The wheel components are made of both aluminum and chromoly – the fork is made of the former, the steerer the latter. Plus, all of the hubs have a low profile and rounded hex bolts. This means that there aren’t any sharp edges in places where your children’s legs could get a scrape and scratch. On top of the enhanced design, the Alpha Two comes with Tektro front and rear brakes – and the brake levers are perfectly within reach. There’s also a double chain wheel guard which will help protect the front chain ring. The bicycle itself comes in silver, but there are a few customization options on the Prevelo website available, including a: bell, kickstand, name lettering, and colored grips. Although the Prevelo Alpha Two comes 95% assembled, there are a few parts of it that you’ll have to put together upon arrival, including the pedals and attaching the handlebars to the stem. Prevelo has thought ahead and recognized that not all of us are bike mechanics. The bike comes with a pedal wrench, hex key and instructions for assembling the bike at home. Please make sure all bolts and screws are properly tightened to ensure your child is safe. 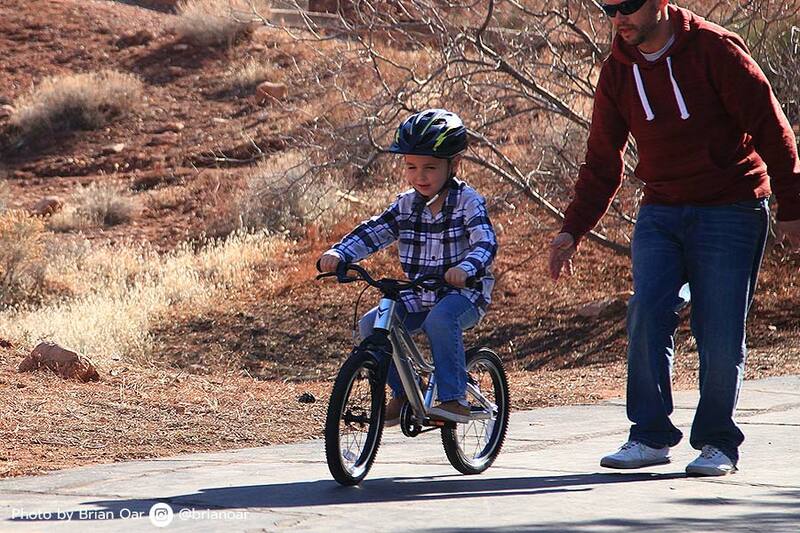 And of course, always make sure your young rider is wearing a proper sized helmet correctly. Hey kid – remember to come back when you need to upgrade. Prevelo also makes 20-inch and 24-inch wheeled bikes. 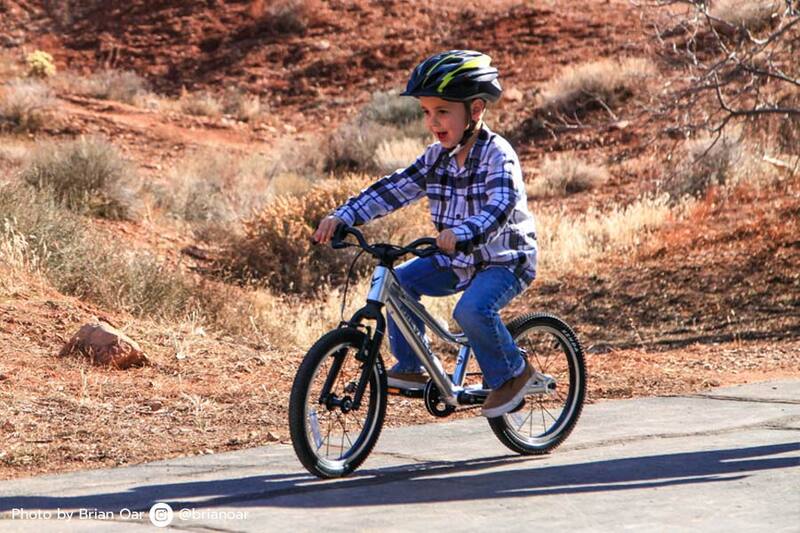 The Prevelo Alpha Two is a beautifully designed, single speed bike for kids. Take a look at the Prevelo website for much more regarding sizing, specifications and geometry. 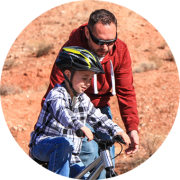 They’ve really done the work to help you make an informed decision regarding your kid’s next bike. 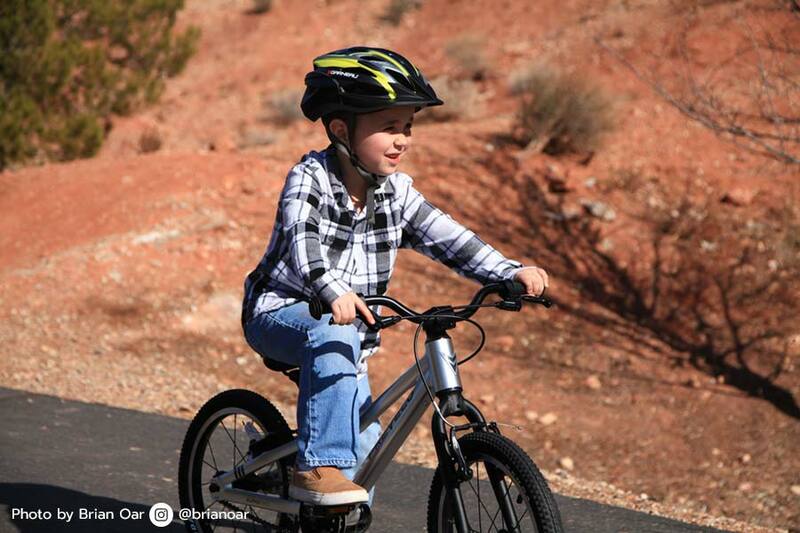 If your child is serious about progressing from a balance bike to a pedal bike, then this model is not to be overlooked. Professional photographer Brian Oar is an artist in photography, music, golf and writing. He prides himself on unique perspective brought to life from experience, relationships and opportunity. Along with his wife Kelly, and two sweet daughters, his family is the lifeblood of his inspiration. Follow him on Instagram at @brianoar and visit his website www.brianoar.com. Planada Boys Bikes And Girls Bikes – What Is The Difference?